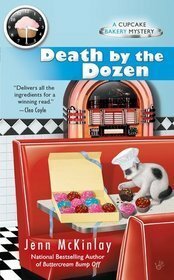 Death by the Dozen is book 3 in the Cupcake Bakery Mystery series. I had such a good time with the other book I read in this series I knew I had to get more. I'm reading these way out of order since I started with book 4 then hopping backwards to book 3 but it actually seems to be okay doing so. The major plot points are going to be different in each book since they're investigating new things. The overall series story arc however will have a few spoilers if you read these out of order. That being said, the author gives enough details of the characters that you can read any as a standalone novels if needed. In this installment, Melanie and Angie decide to enter their bakery, Fairy Tale Cupcakes, into the Challenge to the Chef competition. It's basically like one of those reality cooking competition shows, where the judges have a challenge then cut out people each round. Melanie and Angie have been preparing by waking up early and having a friend bring a mystery ingredient and their chances look promising. That is until they find out some of the judges are Melanie's former professors/classmates from culinary school. One of which doesn't like her and the other, Vic Mazzotta, was her mentor and had a fatherly attitude towards her. Of course, Vic winds up dead pretty quickly and Melanie suspects foul play. We get to guess whodunit throughout the novel as we see the suspect list narrowed down with each page and it really kept me guessing. Death by the Dozen is full of mystery with a little dash of romance and lots of humor tossed in. This installment confirmed that this is going to be a must read series for me since I already adore the characters. I haven't been able to guess the mystery in either book before it's revealed which I'm glad, especially when the clues line up and make sense. Oh and just know if you plan on reading this series that you're going to be seriously craving sweets. If you're a fan of mystery novels or books involving food/baked goods you'll adore this series! Susan Boyce did a wonderful job narrating this book. I already know I'll have to finish up this series via audiobooks since I enjoy her interpretation of each character so much. A mystery novel involving food/baked goods sounds yummy to me ;) Will check this out, and hope you have a great time with the rest of the series! Sounds good. Glad you are enjoying the series. Great review. That sounds good and the cover is quite cute. Cozy mysteries have the CUTEST covers!